The Chinatown Inn, the last remaining business of Pittsburgh's Chinatown. WESA listener Jason Hoellwarth asked a Good Question! "What happened to the Pittsburgh Chinatown?" In the late 19th century, manufacturing was big in Western Pennsylvania, and those jobs were enticing for migrants and immigrants. The factories depended on them, too. About 300 Chinese laborers were hired to work at the Beaver Falls Cutlery Factory in 1872 because of a labor dispute -- striking white workers were replaced with the contracted newcomers, and newspapers at the time reported that the white residents of Beaver Falls were not happy about it. Around the same period, Pittsburgh's Chinatown started to grow. An article in the Pittsburgh Press from 1903 notes that about 180 ethnically Chinese people lived in Pittsburgh by 1900, most if not all within a few square blocks of downtown -- on and between Grant Street, Second and Third Avenues and Ross Street. A sign for the 200 block of Grant Street, a core block of Pittsburgh's Chinatown. Many early residents of Pittsburgh's Chinatown operated laundries and restaurants, creating a bustling neighborhood. "These were the jobs that were available to them," said Marian Lien, president of Pittsburgh's Chapter of the Organization of Chinese Americans and Executive Director of the Squirrel Hill Urban Coalition. "Society at that time wasn't comfortable with a group that didn't look like them, didn't speak the language." Eventually, the restaurants gained popularity among white Pittsburghers. The 1903 article said you could get a bowl of rice for 5 cents, or pick the priciest item on the menu – “chicken chow min” -- for $1.50. Ruth Yee grew up in Chinatown in the 1930s, though she now lives in Squirrel Hill. "We were all born at home, five of us was born on the third floor on Second Avenue downtown," Yee said. "When my father came to this country he only had $50 in his pocket, and he came here with my mother and brother, who was five years old." She said she remembers growing up in Pittsburgh fondly, but did experience discrimination. She said that was largely linked to Japanese exclusion during World War II. "We were not allowed to go to Kennywood Park, because being Chinese they thought we were Japanese and they didn't let us go in," Yee said. Pittsburgh had two fraternal societies -- the Hip Sing and On Leong. The two "tongs," or organizations, had violent clashes in Chinatowns across the United States, each wanting to gain more members and control more territory. In a 1985 newspaper interview, the last of Chinatown's unofficial mayors said Pittsburgh's tong wars were relatively tame -- as time went on, the two organizations mixed. The detailed pagoda-style entrance of the Chinatown Inn. The 1903 article notes there were only three Chinese women in Chinatown at that time, a trend that wasn't unusual among early U.S. Chinatowns. Academic Sucheng Chan writes that some scholars believe that's because the wives of workers who came to America were expected to stay in China, or it was more financially feasible for the husband to leave and send money back. Others suspect U.S. immigration laws restricted Chinese women. That changed. An estimated 500 people lived in Pittsburgh's Chinatown at its height in the early 1920s. Pittsburgh's Chinatown had a string of unofficial mayors -- men who could communicate with white Pittsburghers and city officials as well as Chinatown residents who often only spoke Cantonese. William Hung Yot was Chinatown's mayor for more than 50 years until his death in 1960. He arrived in Pittsburgh in 1900, when he was 15 years old. His obituary notes that he aided other Chinese Pittsburghers in a variety of ways: if one were arrested, Yot would arrive with bond and a lawyer. He supported families who could not afford food or shelter, and was known to be "on hand" for Chinese people in trouble, "not just in the Downtown area but throughout Western Pennsylvania, West Virginia and Ohio." Chinatown's last mayor, Yuen Yee, died in 2008. According to his obituary in the Pittsburgh Post-Gazette, Yee moved to America at six years old, and later worked as a launderer and joined the U.S. Army Air Forces as an interpreter. The obituary says Yee helped his peers prepare their taxes, study for citizenship tests, and negotiate their leases. The Hong Kong Express 2. At the top are Chinese characters for the Hip-Sing Association. Today, not much remains of the neighborhood. Construction of Boulevard of the Allies in the 1920s cut through Chinatown, prompting Chinese Pittsburghers to leave for other communities and the suburbs. Chinese residents likely had little political sway -- County Commissioner meeting minutes about creating Boulevard of the Allies don't mention Chinatown at all. By 1959 only about 30 residents remained. Now, only one restaurant marks where the neighborhood once stood: the Chinatown Inn on Third Avenue has an ornate pagoda-style entrance and roof, painted in red and blue. This was once the home of the On Leong tong. 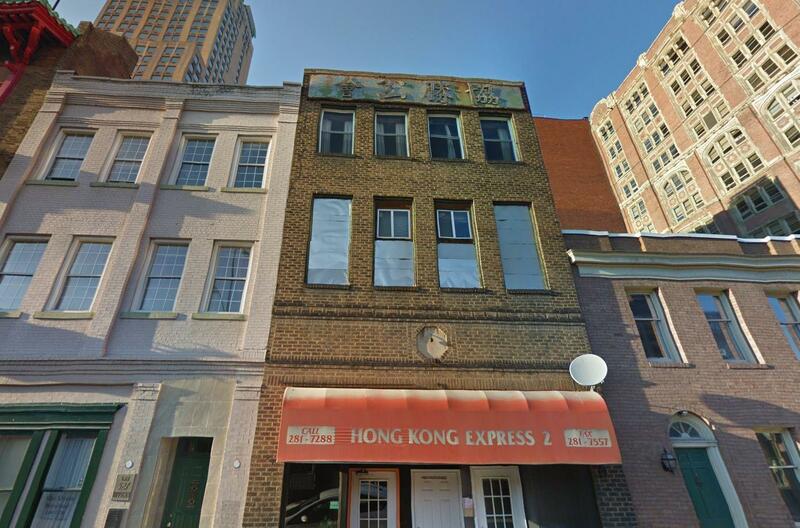 Hong Kong Express 2, a Chinese restaurant on Court Place with Chinese characters on its roof, is the site of the old Hip-Sing Association. But the lack of historical evidence downtown doesn’t mean Chinese culture is gone. Construction of the Boulevard of the Allies put a wedge through Pittsburgh's Chinatown. 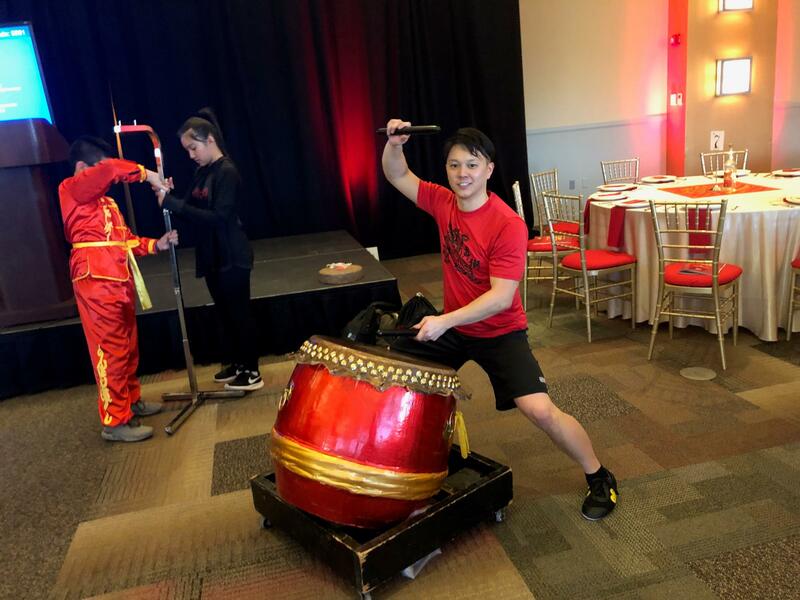 At the Heinz History Center earlier this month, dozens of brightly clad dancers, musicians and martial artists participated in the Year of the Golden Pig Kickoff Celebration. Lunar New Year is a Chinese holiday that lasts for about two weeks. Lien helped organize the event and said the celebration and others like it help young people of Asian and Pacific Islander descent express their identities. "There really aren't enough chances for them to do that," Lien said. "To know where you come from really shows you the roadmap for where you are going to head next." 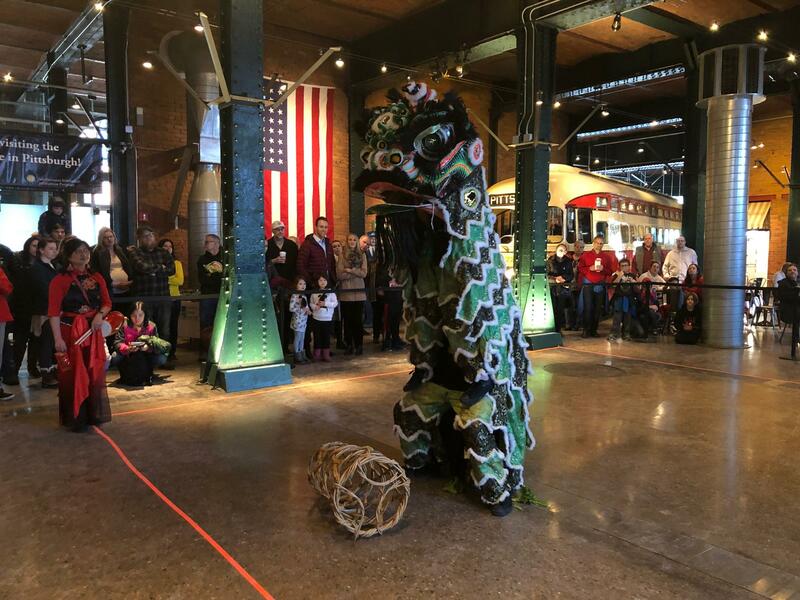 The Steel Dragons Lion Dance team performs at the Heinz History Center on Saturday, February 2, 2018. Allen Peng is Vice President of Education for Pittsburgh's Organization of Chinese Americans, or OCA. At the celebration he performed kung fu and tai chi, and later drummed with OCA's Lion Dance team. He's been involved with the organization since 2006, and said discovering Chinese cultural performance after spending his childhood in Steubenville, Ohio was a big deal for him. "Growing up in the U.S. in some areas where they really don't have Chinese culture, this was a huge eye-opener for me," Peng said. "I just wanted to reconnect with my heritage." Participants in Pittsburgh's Chinese cultural events aren't just Chinese, and Lien said this is a conscious choice. The Lunar New Year kickoff featured a Korean pop music performance and Bhutanese dance. "In coming together as an Asian Pacific American group, we have found that our disparate voices become stronger when we are together," she said. Pittsburgh's Lunar New Year parade will take place Sunday in Squirrel Hill, starting at 11 a.m.